11:30 a.m. - Leave Raleigh for a two-night camping trip. 12:00 - Stop for lunch at Smithfield's in Clayton. 12:10 - Get back in the car with way too much food. 12:15 - Begin answering the eternal question, "Are we there yet?" 3:15 p.m. - Arrive at the ranger station for Hammocks Beach State Park. 3:30 - Leave our car in the parking lot. Load ourselves plus one jogger stroller, one large pack, two large tents, one large duffle bag, one large tote bag, two small backpacks and one cooler onto the ferry. Realize we have a metric ton of stuff to carry. 3:45 - Arrive at Bear Island and disembark the ferry. Eye dark, looming clouds and pray it doesn't storm. 3:47 - Begin walking the half-mile trail to the beach. Thank the heavens and our sweet neighbor for the jogger stroller we borrowed because we've loaded half a ton of stuff into it. Pippi is walking. 4:01 - Arrive at the beach. Buy cold drinks and chips at the snack house. Curse the discovery that they don't sell any other food on the island. Pee while we're at the bath house. 4:19 - Start walking the next half-mile to our reserved campsite. Redistribute the half ton of stuff onto Daddy so that Pippi can ride in the stroller. Thank the heavens for a strong Daddy. 4:36 p.m. - Arrive at the sign for our campsite. Climb past the protected turtle nest, over the dune and down into the valley to our picnic table and tent area. Marvel at how beautiful and quiet it is. 4:47 p.m. - Commence Operation Tent Set Up. Marvel at how patient Daddy is about letting the kids help. 5:18 - Decide we can help Daddy more by going down to the beach. 5:26 p.m. - Decide that I love beach camping because we have the whole place to ourselves and my children are so happy that they pretend to surf. They race in and out of the water's edge in complete bliss. I forget all my worries. 6:14 - Climb back over to our campsite. Make sandwiches and fruit for dinner. Wonder if we brought enough food. 6:58 - Walk back down to the beach. Because we can. Because it's right there. Because it's still light out and we know these kids are not going to fall asleep yet. 7:45 - Realize we're going to wear out before they do. Corral kids down to the bath house for showers and pajamas. Carry them back to the campsite in a futile attempt to keep them from getting sandy. 9:15 p.m. - Daddy emerges from the tent victorious in the battle of Kids vs. Sleep. We enjoy the quiet darkness before trying to brush the sand from our feet and squeezing into the tent to join them. 12:35 a.m. - I climb out of the tent to pee. In the dune, of course, because no way am I walking a half-mile alone in the dark to use the bath house. Lean back into the tent, brush the sand off my feet, rearrange myself next to my family and fall back to sleep. 12:40 - Unbeknownst to the rest of the family, Daddy decides we will only be staying one night. 2:15 - I get up to pee again. Dune, brush, rearrange, sleep. 4:23 - Curse my post-maternity bladder. Get up to pee. Again. 5:45 a.m. - Pippi sits straight up, smiles and declares, "Good morning, Daddy!" 5:45:30 - Junius bounces up and announces "I love beach camping!" 5:45:45 - We pretend to be sleep, hoping desperately that they're both talking in their sleep. It doesn't work. 5:53 - My husband turns to me and says, "I'm just going to say this out loud. We don't have to stay the second night." I am both amazed (because things were going better than I expected) and relieved (because I wasn't sure how long we could last). 6:12 a.m. - We walk down to the beach to watch the sunrise. It's beautiful and peaceful and magical enough to make us forget (for a moment) how tired we are. 6:45 - Return to campsite for breakfast. Fight off hungry bees. 6:55 a.m. - Junius writes in his track-out journal: "I see Trtll Eggs. Thea are in a Net. I like it. I saw The sun Rise today." He draws an adorable picture of a turtle ("Trtll") beside a little cage with circles in it, more or less like the protected nest at the entrance to our campsite. 7:21 a.m. - Pippi entertains herself with the digital camera and her newly acquired shell collection. 7:38 - Walk down to the bath house so I can wash my hands and remove the sandcastle that has wedged itself under my left contact lens. 8:02 - Walk back to our campsite, this time with the ability to see where I'm going. 10:07 a.m. - I attempt to teach the kids how to make drip castles while regaling them with stories of how their Pop Pop used to teach me when I was a kid. End up making drip castles alone until they are crashed by the rising tide. 11:35 - Scavenge for lunch from what's left in the cooler. Trust that the squishy Babybel cheese is still safe to eat. Thank husband for deciding to head home early so that we don't have to go back over on the ferry to buy more groceries to bring back over to the campsite. 1:17 p.m. - Engage in major battle with Pippi about wearing her sun hat. Laugh at how adorable Junius looks in his sun hat -- like a sandy little member of the French Legion. Note to self that dermatologist would be proud of us (okay, maybe not of my swimsuit, but I am COATED in sunscreen). 2:15 - Begin packing up all our stuff. Wonder how we will find the energy to carry it all back to the ferry. Wish we had brought a strong, child-free friend with us to help. 3:15 - Loaded like pack mules and grateful (again) for the jogger-stroller-turned-luggage-wagon, we start back down the beach toward the bath house. 3:21 - Realize we'll never make the ferry if Pippi has to walk. Redistribute load from the stroller so that Pippi can ride. Force her to hold the clean bath towels because there's nowhere else to put them. 3:23 - Fuss at Pippi for letting the clean bath towels fall into the sand. 3:24 p.m. - Realize that Pippi is down for the count (note the puffy cheeks and pouty lip). 3:36 - Rinse off in the outdoor showers at the bath house, change the kids out of their swim suits and race off down the path toward the ferry. 3:52 - Board the ferry. Breathe. If you've actually made it through this whole timeline, I'll reward you by wrapping up quickly: load into the car, find a restaurant for dinner, marvel at Junius as he scarfs down a plate full of fried shrimp without taking a breath, cruise through Swansboro, drive back to Raleigh, unload the car, crash in our comfy, mostly-sand-free, fully air-conditioned beds. Looking back at my years in school, I can point to three programs that had the greatest impact, both on my education and on who I've turned out to be: North Carolina Governor's School, North Carolina Teaching Fellows and study abroad. Now, thanks to severe budget cuts by the state legislature, two of those opportunities have been eliminated for future students. Teaching Fellows currently in the program will still receive support through graduation, but no new students will be admitted. And with help from donations by alumni and friends, the Governor's School Foundation hopes to find a way to continue -- but even raising more than $100,000 over a few weeks is no guarantee for survival. So why should you care? Governor's School is just for nerdy smart kids who will do fine in school regardless, right? And plenty of people want to be teachers, so there's no need for a recruitment program, right? For nearly 50 years, the North Carolina Governor's School has offered incredible enrichment programs for some of our state's most talented and intelligent students, many of whom come from small, rural school districts without the resources to provide similar challenges at home. While it may be tempting to dismiss these opportunities as extras for kids bound to succeed, national studies estimate that between 18 and 25 percent of gifted and talented students actually drop out of school. More than 100 programs in 28 states have been modeled after North Carolina Governor's School -- a testament to the program's value. Participants demonstrate significant gains in cognitive growth, moral development and global thinking. For me, it was a life-changing experience in so many ways. Similarly, the North Carolina Teaching Fellows Program has, for more than 25 years, recruited "the best and the brightest" into our state's public school classrooms. The average profile of a Teaching Fellow includes an SAT score over 1100, a high school GPA of 4.0 or more on a weighted scale, and a rank in the top 10% of his/her high school graduating class. Many of them might not go into teaching -- or even be able to afford to go to college -- without the Teaching Fellows program. Not all of us (myself included) stayed as classroom teachers, but everyone I know who completed the program has become an advocate for public schools in one way or another. Our students and schools as well as our communities and state are enriched by the graduates of this program. At a time when many bemoan the fact that the U.S. lags behind other nations in academic achievements, it is shortsighted (at best) to eliminate programs that help our students and state remain globally competitive. If we're not supporting our most talented students or encouraging our most promising future teachers, then how do we expect to cultivate the next generation of geniuses for our country? NOTE: If you'd like to make a gift to the Governor's School Foundation, visit their website and help them reach $200,000 by August 1. What? Are you surprised? Thought I was too disorganized to have much to offer? Well, you're wrong. So there. In fact, because I occasionally nearly always have some mess here and there taking over my house, it turns out I have much to offer on the topic of organization. Thankfully, my dear friend Julie recognized this wealth of lessons learned the hard way knowledge I have to share and invited me to guest post on her blog. So head on over to Simplify Your Life to learn more about what you should do to get organized BEFORE you start a home renovation project. 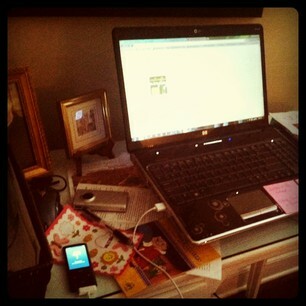 And while you're there, be sure to check out some of Julie's great tips about getting organized and staying that way. One of my favorite features is her "Ten in Ten on the Tenth." In the meantime, I'll be over here writing a new soapbox post about Teaching Fellows and Governor's School and why they matter and how your donation to the GS Foundation can make a difference. My kids can get some serious mileage out of a Halloween costume. It's not unusual for Junius, Pippi and friends to appear downstairs in a combination of Spiderman, Batman and Buzz Lightyear costumes with a couple of ballerina-fairy-princesses thrown in for good measure. But today, Pippi took the costume recycling to a new level. When I saw this week's prompt from Adventuroo, my immediate question was "place"? As in singular? Like I just have one pile and everything else is neatly put away? 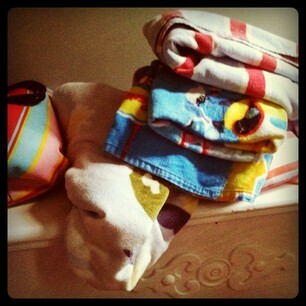 A couple years ago I wrote about the pile on top of my dresser as an archaeological dig. Thinking of it as a science experiment somehow made me feel better about this mess. For this post, I just made the circle around my downstairs and found the following ELEVEN gems -- by artsifying them in Instagram, I am somehow less ashamed. 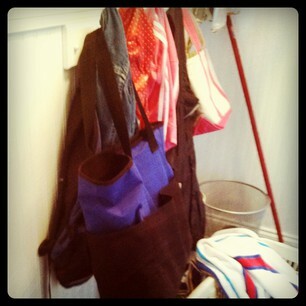 In theory, the hooks are a good way to organize. In reality, they become a messy catch-all for things that don't belong. 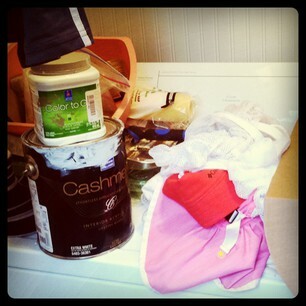 Paint supplies and furniture sliders from the renovation (that we finished in APRIL), plus laundry bags, two sun hats and the corner of a Zappos box for returning the ugly hats. 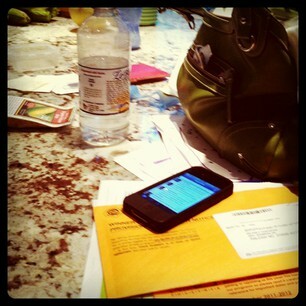 The primary counter, which should be for people sitting at the counter stools we haven't bought yet, is covered with mail, cups, purse, lunch boxes and my husband's iPhone. In the floor area under the counter where we don't have the counter stools we seem to be storing our borrowed card tables (for monthly summer happy hour), two rugs we had to pull out of the attic after the latest leak and a duffle bag and table cloth left over from camping. This is my lovely kitchen desk area. Too bad you can barely see the fancy granite we picked out. 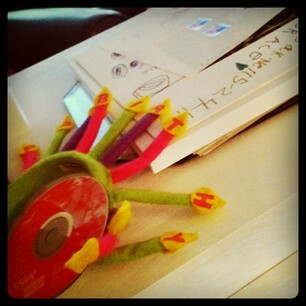 This is more mail, coupons, bills, lists, school pictures, preschool projects, travel-sized toothpaste and phone messaged. The pile is going vertical by creeping up the wall, too. 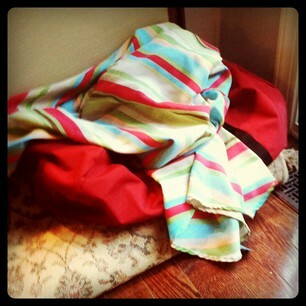 The pool bag and a stack of at least five beach towels rest on the chest by our front door. At least they're not on the floor anymore. 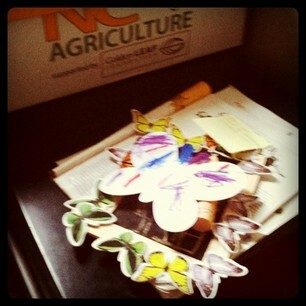 This pile on the table beside the font door is unusually small -- just Pippi's artwork from today's preschool camp, one list, a copy of The New Yorker and our empty Produce Box. This sad space is my tiny desk, crammed with stickers, Flip cam, iPod, photos, lists, newspaper clippings, birthday party invitations and a basket full of random papers leftover from my last attempt at organization. At least my laptop isn't on the kitchen counter anymore. 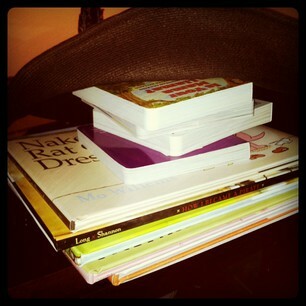 Stacked on top of my grandfather's china cabinet you'll find children's books that I bought to give as birthday and new baby gifts. Note that not one of them is wrapped. And on top is the enormous, glamorous hat #5 that Casey (so far accurately) predicted I would never actually wear. On one side of the dining room cabinets you'll find my grandmother's deviled egg dish (c'mon, every Southern girl has to have one) hidden by empty gift bags, gift list (for which not one single thank you note has been written), party favors and presents from Junius' birthday party. Which was almost a week ago. And on the other side of the dining room cabinets, there's the birthday head band thingy, a kid's book CD, a picture from Pippi and a friend-decorated picture frame that needs to have the picture put in it so we can hang it on the wall. Clearly I am in desperate need of an intervention from my friends Julie at Simplify Your Life or Molly at Go Mom! Inc.
How about you? 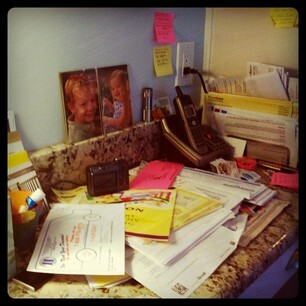 Help me know I'm not alone -- what piles are building up around your house? If you've ever met me, you probably know that nothing about me suggests I'm a camper. Happy, yes. But not a camper. I have, on a few occasions with varying degrees of success, attempted to play a camper on TV. Or, more accurately, at a campsite. Car camping. The way nature intended for us to camp. Freshly graduated from high school, my girlfriends and I drive up to our campsite, unload 47 bags (I'm just estimating), hike around the trails, lounge near the waterfalls in our bikinis, stay up too late talking, and use the bath house for showering and fixing our hair. Verdict: Camping success. But no need to do it on a regular basis. In an attempt to be way cooler than I actually am, I foolishly agree to go on a white water rafting/camping expedition with a high school group being supervised by some of my friends and fellow teachers. I borrow some gear and miserably fake my way through the whole trip, including hiking in to our campsite carrying everything with us. The constant rain and chill dampen my spirits (and my hair) beyond repair. Verdict: Camping fail. Nothing good can come of sleeping in cold rain. My sweet fiance (at the time) persuades me that beach camping is the best. Being a lifelong beach girl and devoted bride, I believe him. We drive from DC to the Outer Banks with no air conditioning on the hottest August day of the year, arriving at our campsite in time for a brutally icy shower before dinner. After a sleepless night battling bugs and sweat, my husband-to-be declares he's packing up the tent and doesn't speak to me for the next several hours. We go to a hotel and sulk for the second night of the trip. Verdict: Camping fail. Thankfully we still got married six weeks later. Verdict: Camping success. Just don't push your luck past one night. For my friends who have vasovagal syncope -- or those of you who are just squeamish -- you should probably stop reading this post. Check back on J-Fest 2011 or some cute photo of Pippi until we're done here. For the rest of you -- those who need a reminder to wear a hat or want to scare the hell out of motivate your kids to put on the sunscreen -- here's the latest on my head wound. As you may recall, I had a basal cell removed from my forehead nine week ago. Nine. And in case you're wondering, my skin surgeon put a bandage back on it right after she took that picture for me. The sad news is that this photo looks a lot better than the crater I was peering at last week. So yes, that's another week of a bandage on my head that can't get wet. Another week of my sweet husband washing my hair in the sink for me. Another week of walking around with a big white circle on the corner of my forehead that makes everyone look at me like I just might be a lost amnesia victim. Sigh. At least I have cute hats. A lot happens around here in the course of a year. So it's great to have the blog to look back through things we've already forgotten. Today Junius is officially six. As in, closer to 10 than birth. I suspect that if I blink slowly, I'll open my eyes to discover that he's 16. Gulp. First Day of Kindergarten (Aug. 4, 2010): The backpack looked so big and he looked so little. But he wasn't nearly as emotional about the day as his mommy was. Carolina Hurricanes Bring on the Fun (Sept. 19, 2010): Junius has turned out to be quite the serious hockey fan. Thankfully, there's a lot of fun that comes along with that. You've Got a Friend in Junius (Jan. 31, 2011): One of my proudest moments during the school year wasn't about Junius' academic performance. The F-Word (April 5, 2011): Junius is a bit of a tattle-tale. But sometimes, his tattling is hilarious -- like in this episode about his sister's language. Sign That Summer Is Coming (May 13, 2011): Junebug + friend + slip-n-slide = summer. It's good times in the front yard. Hair (June 14, 2011): Juni and I both got lots of cool points for this one. We also had to buy new hair product. Happy birthday, Junius! May the coming year be just as amazing! 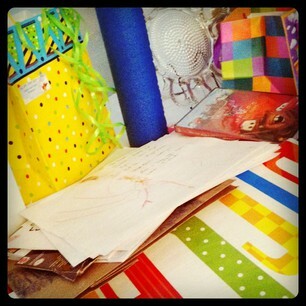 Click these links for favorite posts from Junius' 5th birthday and 4th birthday. And feel free to share your favorite Junius story in the comments below. Junius takes after his mom when it comes to celebrating birthday -- counting down for months in advance and then extending the party as long as humanly possible. And why shouldn't we? No matter how old you get, having a birthday is always better than the alternative, so you might as well make it worthwhile. If you thought that J-Fest was just a blogging activity, you'd be wrong. We've actually been celebrating Junius and his birthday in various ways since the last week of June. Not cake and candles every day, but doing a variety of things specially for him. Cupcakes at school: Even though he goes to a year-round elementary school, he's still tracked out in July. So we took cupcakes to share with his classmates on the last day of school -- he got to wear the birthday crown and have everyone sing "Happy Birthday" to him in the cafeteria. Touring the museum: Junius loves a museum. I'm not always sure why, but I think it just seems a little exotic to him. So on July 4th, we took our patriotic selves downtown to the NC Museum of History -- armed with an activity pack from the front desk, we explored our state's history from the American Indians to the NC Sports Hall of Fame (including a look at Richard Petty's race car). Camping at the beach:We took our first family-of-four camping trip at the beach this week (see photo, with more posts to come next week). Junius has been begging for all of us to go, so this seemed like the perfect time to grant his request. We also came home a little earlier than planned, so Junius and I snuck in some free bowling at Sparians, a bonus trip to Marbles and a lunch date at Bruegger's. Sleepover with "cousins": One of our most favorite families recently moved away, but they're making the trip back to town for our celebrations. That means we get a bonus party with Ms. B and our fake cousins, who will be spending the night at our house. Hoping he enjoys the sleepover with pretty girls when he's six because it won't be happening when he's turning 16. One of the funny things about having kids is watching them turn into people. As in, actual people with their own opinions and attitudes about everything on the planet. I realize this might seem blindingly obvious, but somehow it startled me when Junius didn't like the clothes I picked for him. Or when he'd refuse to eat something that I knew for a fact to be delicious because he had decided he didn't like it. This one I could have guessed. Ever since his dad took him to his first Hurricanes game, Junius can't get enough of hockey -- whether he's watching live, watching TiVo or playing in the driveway. Genetically speaking, there's no chance he could have preferred anywhere else. Thank goodness we didn't cancel each other and give birth to a mountain boy instead. For those of you without little boys, that means his collection of toy cars from the movie "Cars." He has at least four different Lightning McQueens, plus an assortment of everyone else. This one I'm questioning. I think his favorite color is actually red, but perhaps he's picking dark blue just to annoy me. At least he doesn't have a Duke t-shirt. I know they're not the world's healthiest food, but they're damn tasty -- especially grilled or served at a baseball game. He likes his with ketchup and a bun. Tomorrow find out about all our celebrations during J-Fest 2011 as we prepare for the big day! We're celebrating Junius all week as he turns 6! Again, that's six years old, people. Crazy stuff -- and it means he can do all sorts of cool things that he couldn't do when he was a preschooler, including making more of his own decisions. Sometimes that's hard for me to let go of, but it's also fun to watch him figure out what matters. And it's interesting to see when he has strong opinions about something that I wouldn't have predicted. Getting dressed: If left to his own devices, Junius would wear all red most days -- as in, red basketball shorts and a red hockey t-shirt. For variety, he'd add his blue/yellow basketball jersey. This makes me crazy, so we came up with a deal. On Monday through Thursday, he has to wear a collared shirt to school (although most days I let him pick which one) and on Fridays he can pick what he wants. It's not always fashionable, but it mattered to him. Making breakfast: Because Junius wakes up like an alarm clock stuck on 6 a.m., my husband had the great idea of teaching him to make his own breakfast. Now he picks out his cereal, toast or English muffin (most days) and gets himself fed before school. Riding the bus: Although it made us a little a jittery to imagine our little kindergartner on the bus with 5th graders, Junius really wanted to ride the bus home from school each day. Thankfully, our 3rd-grade friend was also on the bus, so we said yes. I have no idea why he liked riding the bus, but he did -- and it was nice that Pippi and I didn't have to sit in carpool during what used to be her naptime. Playing hockey: As native North Carolinians, my husband and I were probably most likely to encourage Junius to play basketball or soccer or swim team. But the kid loves hockey, so he's decided to learn how to skate this summer so that he can start learning to play hockey in the fall. We're bracing for cold days sitting in the stands, but we'll be there to cheer his choice. 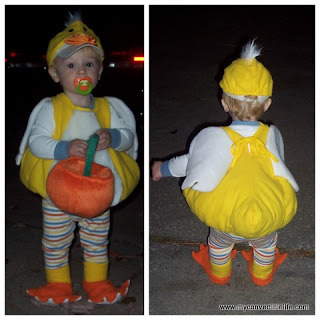 Halloween costume: Last Halloween was the first year Junius decided on his costume entirely on his own. And interestingly enough, he ended up choosing two -- Batman and Spiderman. Guess my days of suiting him up in adorable animal costumes are long over. In some ways these seem like small decisions, but it's a step. A little bit of control over his own young life. And before we know it, he'll be deciding on summer jobs and college tours and all sorts of big fat hairy deals -- hopefully getting in some practice early will help in the long run. Junius turns six this week. That means it's time for J-Fest 2011! Did I mention he's (gasp) six? He's changed so much in the past year -- although I sometimes miss his little, round baby self, it's absolutely incredible watching him grow up. So rather than write about how ridiculous it is that he seems so big, I'm going to give you a list of really cool new accomplishments of the past year. Reading: My boy can read. Not in a jump-into-a-novel-totally-fluent kind of way, but in a understand-that-sign-and-read-to-my-sister kind of way. As a book geek, I'm in complete and total love with watching him read. Writing: Not only can he read, he's also learning to spell. He writes the sweetest notes, like "I luve you Mommy" and "My dad is the best." Clearly he's on the path to a great career in marketing and public relations. Math: After school one day, Junius came home and asked me, "Mom! Did you know? That if you take two? And add another two? You get FOUR?!" He was amazed at the concept and I still grin when I watch him calculate. Basketball/Baseball: Junius participated in his first two team sports this year -- winter basketball and spring baseball. It's possible that his favorite part was the uniforms (he's still wearing that basketball jersey), but he worked hard, learned a lot and joined his teams with a smile. TiVo remote: Okay, I realize I'm admitting one of my less-than-stellar parenting techniques with this one, but the fact that Junius can operate our TiVo remote has revolutionized mornings at our house. Both kids wake up at 6 a.m. Every. Single. Day. So if Junius can come downstairs with Pippi, get their milk cups out of the fridge and find an age-appropriate show via TiVo, Netflix Instantly or general television, that buys us an extra 30 minutes in bed. More J-Fest 2011 lists will be coming the rest of the week -- hope you enjoy celebrating with us! For his official birth announcement press release, click here. Because I can't seem to make my wound heal any faster (turns out I've got a staph infection, so I'm taking an antibiotic FOUR TIMES A DAY FOR TEN DAYS), I'm focusing now on how to prevent any more skin damage. I've decided it's finally time to embrace the hat. I took these photos myself, which was a little tricky given how big the brims are on some of these hats. My arms are long, but they're not Inspector-Gadget-long or anything. With the lump of bandage on my forehead, I can't get the hats all the way down on my enormous head. And when I try to do it anyway, it hurts. We'll just have to pretend for now. Looking at pictures of myself is one of my least favorite activities. Let's just focus on the hats, shall we? 1. Lightweight bucket hat: I love the super lightweight fabric on this hat -- some kind of magical Columbia sportswear fabric. The brim is smaller in the back, so it doesn't bump against my neck. And if I could actually pull it down on my forehead, I think it will give more shade in the front. Is the color too bright? Or cute and summery? Maybe hard to tell online. 2. Big brim bucket hat: I'm just going to go ahead and tell you, this hat is going back. It looks so terrible on my that I couldn't even get a decent picture. It's too shallow and won't sit down far enough on my big ol' head, even without the bandage. A shame, really, because it seems very pack-able. 3. Taupe ribbon hat: I had high hopes for this hat, but it just doesn't seem right. Not sure why, but I couldn't get it to bend evenly so that it would sit straight. But the little ribbon lines are very cute, so maybe it's worth trying? 4. Tan ribbon hat: Much easier to bend than #3, this hat is very light and has a bendable wire edge to help it hold its shape. But is the color too light for my pale skin? 5. XL brim brown hat: This hat is so big that I honestly wasn't sure I could capture it all in the picture -- it shades not only my face, but also my entire shoulders. 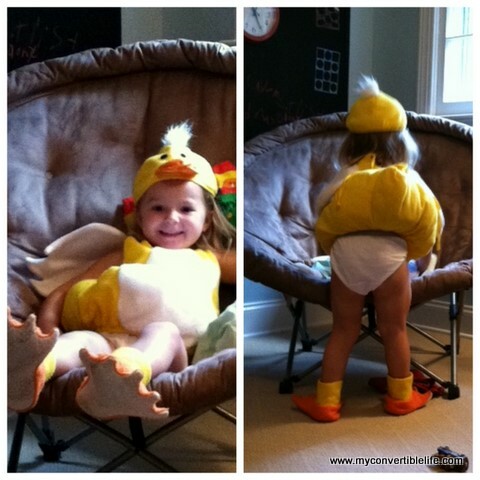 When I put it on the first time, Pippi stopped in her tracks and said breathlessly, "Mommy! That hat is FANCY!" I want to believe it's very Audrey Hepburn, but someone else in my house (who will remain nameless) made sombrero references when I pulled it out of the box. Too much? Or just the sort of glamour my poor head needs? Okay, readers -- help me out here. What do I keep and what do I return? Or if you've got better hat options I should consider, leave me some links in the comments.